​Wrestling is a competitive sport involving technical movement such as clinch fighting, pins, takedowns, and throws. A reason why this might have been caused was that Reagan's Wrestling Team has only been existing for only two seasons. At Reagan, wrestling was the underdog of sports since other sports like basketball and football had more of a popular appeal. Westling hasn’t gotten the attention that some people think it deserves. This season, however, has seen a significant change of appeal through Reagan's sport community. Wrestling has gotten attention due to their determination and their willingness become champions. Another factor of the wrestling team’s growing popularity are the team members, specifically the girls competing in this year's wrestling season. The question of being a girl in any sport is a challenge in itself rises for many people. Are there misunderstandings that people have about women in wrestling? Medrano addresses the misunderstand that female athletes play sports, because, “they want to be more masculine and less feminine. That they are the only girls that wrestle and that don't like dresses or makeup, that we're all just tomboys, when really we just enjoy the sport like anyone else.” Medrano also states her opinion towards “you fight like a girl” by saying, “At first I didn't like it because I took it in a negative way but in wrestling we tried to create the saying ‘wrestle like a girl’ since our Reagan girls dominated this year. It makes me feel proud and want to fight like a girl.” Serena also shared her thoughts on the importance of the fighting the stigma of female wrestlers, “Girls have the ability to do any sport just like a guy. I've seen girls beat boys in wrestling multiple times. Just because society doesn't like it doesnt mean we should all fall in line and not do what we love.” For the girls in wrestling, they don't only compete to prove that girls can wrestle as good as boys, but simply because they enjoy it. The feeling of being part of a team and wrestling is what makes these Reagan girls keep on competing. As the season came to a close, we can only wonder what amazing things are to come for this growing wrestling team. The constant array of students names on the intercom after a forensics meet from the previous weekend. . ‘At this weekends forensics meet there were a number of finalist and in the places of first were….’ Though some may not pay attention, the students who competed in the forensics meet are beaming when their name is announced to the whole school, because the hours of practicing at home and in front of coaches finally pays off. Week after week, winners and finalists are announced for the whole school to hear. Many hear these announcements, though not many understand what is ‘Forensics’. Essentially, Forensics is competitive public speaking. It has an array of genres, ranging from poetry and prose to serious solos and extemporaneous speaking (short speech based on ongoing events). They all center on the main theme of public speaking in front of judges and eventually getting ranked. Usually the top five of the category will go to the finals, more commonly known as the ‘power round’, where there will be two finalists and three places (1st, 2nd, and 3rd). Though that is solely the competition, the competitors on the other hand have their array of preparation and methods to put forth their best performance for themselves and ultimately the judges. The competition begins with practice. Students that partake in forensics either practice Tuesdays, Wednesdays, or Thursdays for an hour and a half. They then split into groups. Two practice with student coaches and one with the main coach, Ms. Baker. Practice leads to almost perfect performances eventually to tournament saturdays. They are a bit lengthy but in the end it’s truly worth it. The tension eases eventually. Students, new and old, return or join the forensics team for hours of agonizing practice, which result in the tournaments they then go to. As new competitor freshmen Regis Brown stated he’s been doing it since middle school, and his love for acting he thought it would be a perfect fit for him. Lots of forensics students have joined the High School forensics team from their fond memories of middle school. Though it isn’t always easy, it may be easy to go up there and present but the whole idea of competing as Regis said is the difficult part. 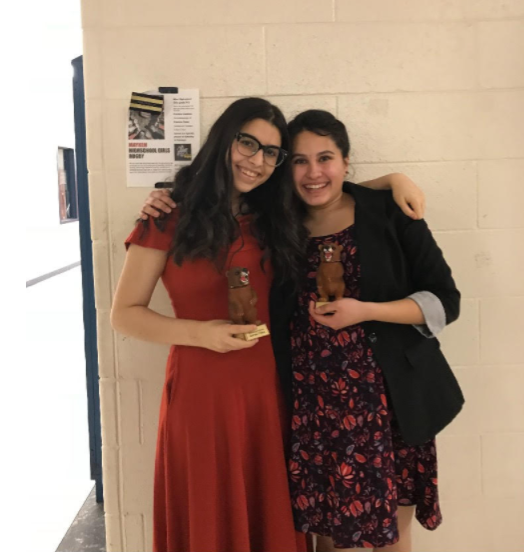 A returning forensics competitor and student Rihana Zaiani gives us a different outlook on the forensics life. Though she also agrees that there is hard work into play, getting the category that fits you best will result in something amazing. Actually Rihana is in two categories which she herself finds a bit hectic. After doing all three rounds for her two categories she then socializes with her team members and new people she meets along the way. Essentially waiting out the time to see if she ‘levels up’ and goes to powerround to compete for hardware. As many may presume forensics isn’t only competitive but a friendly atmosphere. Most students from other competing schools are humble and friendly.